Briar Bay Golf Course will host a 9-hole Twilight League on Wednesdays (“A” League – 12 handicap or less for 9 holes) and Thursdays (“B” League – up to 26 handicap for 9 holes.) League play starts at 5:15 pm each week. Each team is composed of up to 4 players but only 2 players from a team may play each week. Winners of each league will be determined by a final week playoff. Individuals may signup as substitute players to be drawn from a pool. Substitutes will play each week they show up. Entry fee is $90 for a team and $45 for an official substitute. Entries due by April 1st. 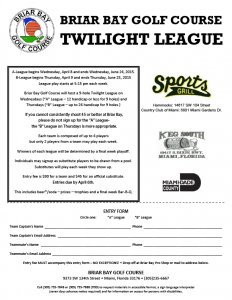 Download the league flyer (PDF) and return it to the golf shop at Briar Bay Golf Course.